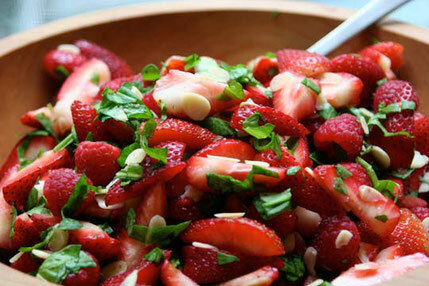 Strawberry-Arugula Salad with Ricotta topping . . . This refreshing salad pairs sweet summer strawberries with the crunch of almonds, the subtle bitterness of arugula, the zing of lemon zest, and the creaminess of nutmeg-tinged ricotta. It tastes as lively as it looks. We picked 5 cartons of fresh strawberries and added almonds for a soft crunch. Then we added baby arugula also; fresh spiciness for a complement to sweet berries. We tossed together a creamy and crumbly ricotta, a zested lemon and added a 3 tablespoons of sugar for a dressing on the side.